The Bermuda Gymnastics team returned today [Dec.4] from after a successful showing at the annual “Holiday Classic” held at Yellow Jackets Gymnastics in Middleton, Massachusetts. 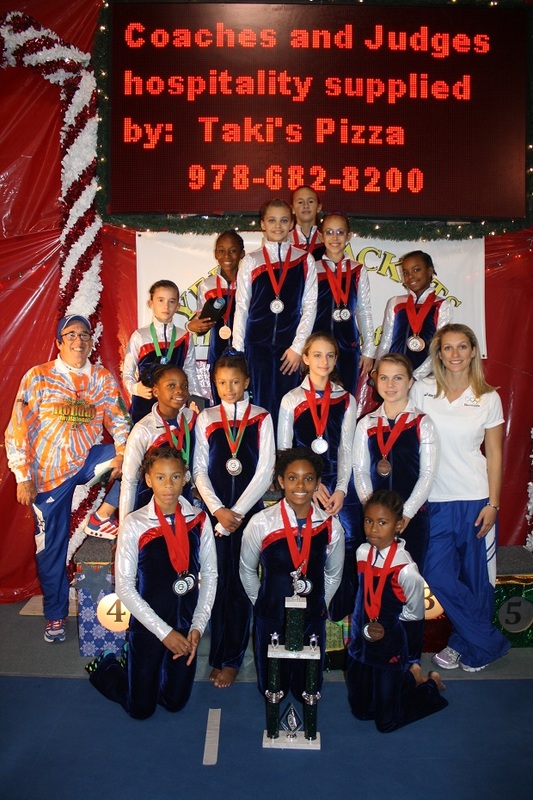 The 13 gymnast squad competed on Sunday, December 4th in the “advanced” and “superior” divisions — the two highest levels of the competition — and picked up a number of medals. Participating in the advanced division were: Anah Lightbourne (10, Harrington Sound Primary), Tomei Talbot (11, Whitney Institute), Ava Marshall (11, BHS), Maya Malpas (9, Saltus), and Trinity Wilson (10, Warwick Academy). Lightbourne was Bermuda’s top finisher, earning a silver medal for her balance beam routine (8.9) and 6th place all-around with a 32.750. Just behind her was Talbot, whose bronze medal performance on floor (8.85) helped her finish 7th with a 32.6. Marshall, Malpas, and Wilson finished 9th (31.25), 10th (30.25) and 11th (30.2), respectively. Coaches Duke Nelligan and Mandi Baughman were especially pleased with this young squad, most of whom were competing in the advanced division for the first time. “The girls really had to focus and go for some new, more difficult skills for the first time. Everyone stepped up to the challenge and it was great to see them support each other whether they were successful with the new skills or had a mistake,” Ms Baughman remarked. Eight Bermuda gymnasts participated in the Superior Division: Tabytha Hofheins (14, Warwick Academy), Sadia Wilson (11, BHS), Clara James (12, BHS), Danielle Wall (12, BHS), Zantae Dill (13, Saltus), Samantha Soares (11, Warwick Academy), Zekiah Lewis (10, West Pembroke), and Anna Francoeur (8, Warwick Academy). In the senior rankings Hofheins placed second overall with a score of 34.250, and earned a pair of silver medals for her vaulting (8.35) and uneven bars (8.3) performances. The remaining gymnasts took away an impressive medal haul from the junior division, led by Wilson who earned three gold medals: vaulting (9.0), uneven bars (9.1) and in the all-around (35.7). James finished just after Wilson with a 33.50 and was the balance beam champion with an impressive 9.35, Bermuda’s highest mark of the meet. Youngest team member Francoeur (who returned to the island this summer after two years in Prince Edward Island) made her debut on the Bermuda team by winning floor (9.2) and the bronze medal in the all-around (32.9). Dill (5th overall) and Lewis (4th overall) turned in a pair of solid beam routines for 2nd (9.15) and 3rd (8.75) place respectively, while Wall (6th overall) shined on floor with an 8.85 for 4th place. Soares (7th overall) had her top score on balance beam, notching an 8.6 for 5th place. The highlight of the competition came when Bermuda was announced as the overall team champions in the Superior Division, which marks continued success for the team after winning the junior division at the Island Games this past July. The girls proudly carried their team trophy through the airport upon returning to Bermuda today. Head Coach Nelligan was very pleased with all of the gymnasts: “Our goals for this meet were simple: to go for the new skills that the girls want to add to their routines and, as always, to represent Bermuda positively. We may have had mistakes here and there but the girls remained focused and pulled together as a team. Interesting, nobody has a thing to say. I guess nobody could find anything negative to say, so they say nothing. It’s good to read something positive for once instead of the usual shootings or other crimes that everyone has time to comment on! Well done to all these young ladies for their good work and representing Bermuda in such a winning fashion! Great going girls and coaches. Continue to chip at it and I am certain the results will show as you reach the top. I am pround of the team. My prayers are continually with all of you as well as the parents/guardians of each of the gymnasts. You can do it!!! !